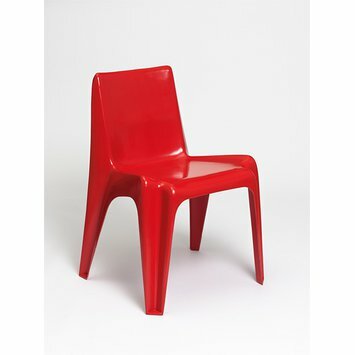 This chair is probably the first one-piece mass-produced plastic chair. It was designed by Helmut Bätzner's architectural office during the 1960s in conjunction with the building project for the State Theatre in Karlsruhe (Germany). Plastic furniture was still a new venture and Bätzner, seeking advice, presented his idea to furniture manufacturer Bofinger. He became a powerful supporter of the project, eventually lending his name to the chair. The chair could be produced in only five minutes with little finishing needed. It was intended as additional seating indoors as well as for outdoor use and had to be light, moveable, stackable, compact and weatherproof. The chair's popularity is confirmed by a production of over 120,000 examples. One-piece polyester resin in solid colour with a continuous shape forming four legs, seat and back. The relationship between the press mould and the chair is evident in the accentuated outlines of the chair. The polyester resin appears as if wrapped around the mould. The chair is characterised by wide overhangs. The legs are a v-shape tapering up from the shorter sides of a triangular base. This shape gives the legs exceptional strength. The back two legs extend upwards to form a back support for a simple, slightly indented, rectangular back. The tapered legs, narrow at the base, reach the widest point at the height of the seat, the back support then narrows again towards the highest point of the chair. The front legs continue smoothly into the seat. The edges of the chair are very distinctive and reveal the thickness of the chair. From the front the chair, the edges of the legs are directed outwards, whereas the edges that join the four legs curve inwards. From the back, a single, sharp edge is the main focus which is slightly turned outwards, because of the tapered back support. Looking at the chair from behind reveals the curved base of seat and back. The back appears as if it has been stretched out from seat and legs. The chair was produced in eight colours, including yellow, black, red and blue, and is glossy in appearance. The chair was developed in 1964 and 1965 in connection with the construction work for the State Theatre in Karlsruhe for which Bätzner's architecture office was responsible. As an architect and because of the novelty of the suggested material, Bätzner was seeking advice from the renowned German furniture maker Rudolf Baresel-Bofinger (Bofinger AG) who enthusiastically supported the project. On 14th of January 1966, Baresel-Bofinger signed a license agreement with Bätzner and commissioned the production of the double-shell heated iron ten-ton press. The chair was first presented at the Cologne Furniture Fair in 1966 and received the Rosenthal Studio-Preis the same year. Reinforced plastic had only been in use since the late 1940s by designers like Charles and Ray Eames and it is reported that Eero Saarinen had hoped to be able to produce the 'Tulip Chair' (designed 1956) one day completely in plastic. The desire for an all plastic chair was a strong concern for many designers in this period and much research was directed towards accomplishing this aim. The chair was a huge success with over 120 000 produced. It was very light at just four kilos, as well as stable, weatherproof and stackable. According to Dunas (1996:46), the successors Baresel-Bofinger and the Habit Company factories in Kürten-Engeldorf, Germany endeavoured making the 'Bofinger Chair' with recycled material at the end of 1994. In 1995, a first example was shown at the Cologne Furniture Fair. Modern Chairs 1918 - 1970 (Printed for the Whitechapel Art Gallery by Lund Humphries), p. 63. 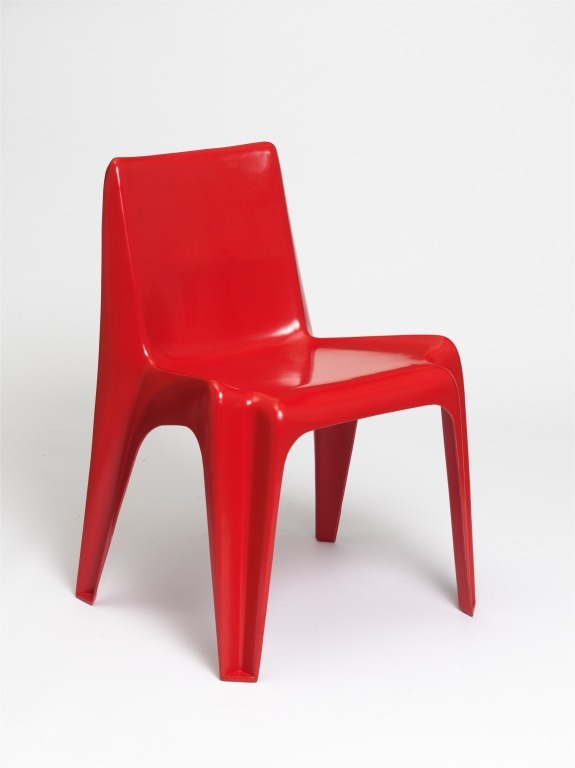 The 'Bofinger' is probably the first mass-produced, one-piece plastic chair. Bätzner designed it for additional seating at the State Theatre at Karlsruhe. The chair had to be light, stackable, linkable, movable, comfortable and weatherproof. This was achieved through long experimentation. The operating cycle lasted just five minutes, in which time a near finished chair was produced. The polyester resin was stained throughout in one of eight colours, and because of the smooth surfaces of the press moulds, chairs were created which required no further finishing (only the edges of the press seams had to be smoothed).